Hello Grade 2! This week we are moving on in Journeys to Diary of a Spider. 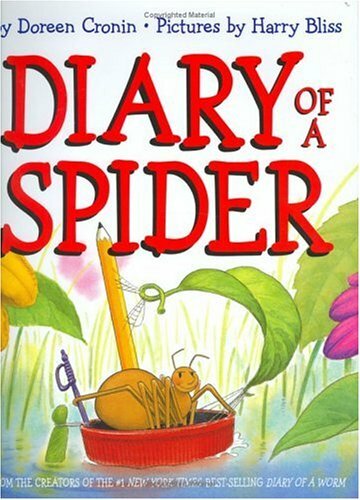 This is a wonderful little book by Doreen Cronin that takes a comical look at life through the eyes of a spider (if the spider thought and lived like we did that is.) Ms. Cronin has written several of these books with titles such as Diary of a Worm and Diary of a Fly. Both of those are in our Happy Kids library I believe. She also writes the great "duck books" about a scheming duck on a farm. Click-Clack-Moo is one we will read later this year. You can see a complete list of her books here. As always we will begin the week looking at our vocabulary words, move into grammar on Wednesday, read the selection on Thursday, and then do a writing assignment on Friday. The spelling test will also be on Friday. Please remember to help your child study for the tests. Below is the weekly handout that should have come home today. On it you will find all of the spelling and vocabulary words along with some grammar practice.